As far as the list of natural phenomena is concerned, the Monarch Butterfly migration, sailing stones of California, and aurora borealis all seem pretty tame in comparison to Colorado’s phenomenon of freaking bears continually trapping themselves in unlocked Subarus, which happened again this week. This marks the fifth-straight time a report on Jalopnik about bears breaking into cars and absolutely trashing them has involved a Subaru, and they’re almost always in Colorado. We’ve theorized why this specific set of circumstances keeps happening in the past, but we’ve yet to find anything conclusive. Why Do Bears Always Get Stuck In Subarus? 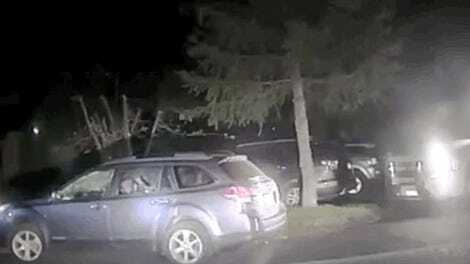 Anyway, this latest bear-in-a-Subaru-Impreza incident happened on Monday in Conifer, Colorado, where two Sheriff’s deputies rigged a rope to the car’s door handle, after the bear somehow managed to get in and close the door and fall asleep, and then they ripped the door open and recorded the great escape. What the bear left behind was an absolute write-off, as bears have not gone through the typical driver’s education program and are used to living in the hard, harsh world of the forest and not the soft, plastic world of what makes a Subaru a Subaru. It also left a half-eaten banana in the cup holder. Lock your Subarus, folks, at the very least so that we never have to sit through another Sheriff’s office pun-tastic Facebook post about it. Via WDTN, h/t to Bryan!